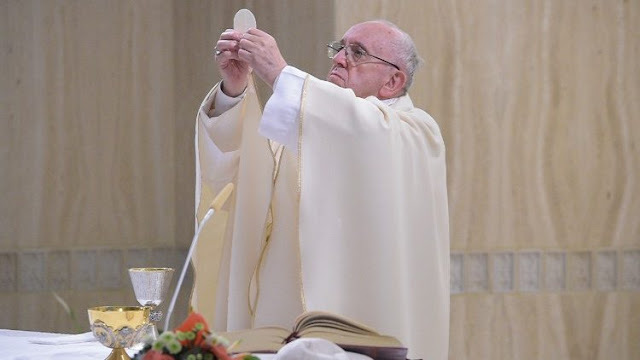 In his homily at Mass at Casa Santa Marta, June 18, the Pope spoke about the devastating power of slanderous communication used by dictators against others. It is something that happens even today. If you want to destroy institutions or people, you start by speaking ill of them. This is the “slanderous communication” that Pope Francis exhorted Christians to watch out against in his homily at Mass Monday morning in the chapel of the Vatican’s Casa Santa Marta residence. The Pope was reflecting on the episode in the First Book of Kings, where Jezebel, the cruel wife of King Ahab of Samaria, used slander and falsehood to have Naboth killed in order to take possession of his vineyard which her husband greatly coveted. The Pope described Naboth as a “martyr of fidelity to the inheritance" that he had received from his forefathers: "an inheritance of the heart". He said the story of Naboth is repeated in the story of Jesus, Saint Stephen and all the martyrs who were falsely condemned with slander. The episode also reflects the ways of “many heads of state or government". One begins with a lie and, "after having destroyed both a person and a situation with slander", one judges and condemns them. The Pope said all dictatorships began by adulterating communication by putting it in the hands of an unscrupulous person or government. This also happens in daily life, the Pope pointed out, saying one begins to destroy a person by starting with communication – speaking ill of others, slandering and spreading scandals, which he said have great seductive power. Good news doesn’t seduce, it passes by, but a scandal draws attention. This is how a person, institution and country ends up in ruins. The Pope said James the Apostle speaks precisely of the "destructive capacity of evil communication". The Holy Father thus exhorted Christians to re-read the episode of Naboth and think of the many people and countries destroyed by dictatorships of 'white gloves'.